Spend an enriching holiday in charming Prague and listening to many musical events that take place in churches, palaces, castles, palaces and theatres. This small capital city in the geographical heart of Europe is one of the preeminent classical music centers of the world. Spires of Golden Prague reflect the setting sun, while music rings out from its many churches, squares and castles. During the fall season you can hear a large selection of classics in enchanting Baroque palaces, many medieval churches, stunning synagogues, opulent opera houses, small intimate theaters or chamber music halls. Whether your taste is Vivaldi, Mozart, Dvorak or jazz, your musical pallet will be satisfied daily by at least 10-12 different performances in various venues throughout the city. Lift your souls to the melodies of Mozart or Smetana, feel alive with the sounds of the Carmina Burana or popular operas like Carmen, massage your spirit by Bach and Handel, and be enchanted by Strauss' flowing melodies. Prague is a preferred musical destination all year around. Enjoy concerts and operas in the magical medieval atmosphere of one of Europe's most charming and beautiful cities. Accept our invitation and come with us on a excursion to the place where the Nzi occupation during WWII resulted in the most tragic chapter in the history of not only one town, but also the catastrophic fate of many thousands of innocent victims. Our guide will show you around the entire complex of the former Nazi concentration camp, with narration including authentic personal memories, chilling experiences, and episodes from Terezin's grim history. A UNIQUE WALK THROUGH PRAGUES FAMOUS JEWISH HISTORY. During this walking tour you will see the only Central European Jewish Town Quarter that survived the Holocaust. You will stroll through the Old Jewish Cemetery and visit some synagogues. 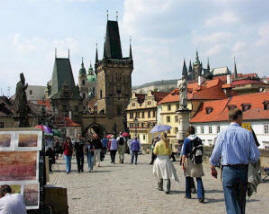 You will then walk through Maiselova Street and reach Old Town Square, where your trip through the past ends. During this full-day excursion you will have a chance to admire the beautiful south Bohemian countryside with its picturesque villages and many ponds. Česk Krumlov is a town on the UNESCO heritage list. The unique urban complex comprising three hundred historic houses and the Castle and Chateau, the second largest after Prague Castle, draws many visitors every year and is rightly called the Pearl of Renaissance. The world-famous spa town of Carlsbad situated in a picturesque, forested valley is known for its 12 thermal springs. Upon arrival visit the glass exhibition at the Moser factory. Then, as you stroll through the town along the spa colonnades, you will have a chance to sip the water from the mineral springs and taste the delicious local wafers and the traditional herbal Becherovka liqueur. Visit Karltejn Castle, which was built in the 14th century by Charles IV, the King of Bohemia and Holy Roman Emperor. At that time the Castle held the treasury of the Empire, including the imperial coronation jewels. In winter, should Karltejn Castle be closed, we arrange an alternative . Kutn Hora is an old mining town founded in the 13th century and famous for its silver mines. Visit the Gothic St. Barbora's Cathedral with its valuable murals and the former royal mint which once produced the so-called Prague Groschen. To this date Kutn Hora has retained the character of a medieval city and rightly belongs among the most important UNESCO Heritage Sites in the Czech Republic. You will also visit a unique Ossuary. A bus will take you to the Vltava River, where an air-conditioned leisure boat awaits you. The hour-long cruise along the Vltava River with refreshments (coffee or tea and cake), offers fantastic views of the river, its banks lined with exquisite historical monuments, such as the Rudolphinum, Charles Bridge, Prague Castle, and more. At the end of the cruise your guide will take you along Pařiska Street, through the former Jewish Quarter to Old Town Square where the tour ends. Extensions to Vienna, Budapest and other European cities are available on request!